The REC35, OSM35 or VCB35 can be pole mounted in recloser, breaker or sectionalizer configurations. 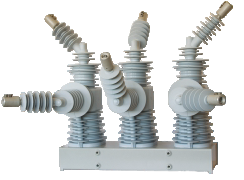 In the standard configuration, the design is built for the ANSI standard 170kV BIL. For areas prone to more severe lightning activity, optional extensions increase the BIL range to 200kV, while still retaining the full 1200A / 16kA rating. OSM35 is a unique new product that has no analogues. Many of its elements are patented. The appearance and dimensions of the recloser are amazing. Today, it is the smallest 40,5 kV automatic circuit recloser available on the market. The OSM pole incorporates a vacuum interrupter, a magnetic actuator, a support insulator and current and voltage sensors fully encapsulated by Powersil 600 silicone rubber – a material with high tracking and erosion resistance. The poles are bolted to a metal frame which protects the mechanism against weather impact. The frame is made of a corrosion resistant aluminium alloy is powder coated and provides an IP65 degree of protection. The module is operated by three magnetic actuators one per pole. The OSM can be mechanically tripped by rotating the yellow hook by 90 degrees clockwise. In the OPEN position the vacuum interrupter contacts are held open by the force of opening spring, the actuator acting through the drive insulator. To close the vacuum interrupter contacts a current impulse, derived from a control module is sent through the actuator coil. When closed, the switching module is latched magnetically. To open the interrupter a current of opposite polarity, derived from the opening capacitor in the control module, is passed through the coil. Phase Current sensing is carried out by three Rogowski sensors with star-connected secondaries, which monitor phase currents. Residual current measurement is provided by three current transformers with delta-connected secondaries. Voltage sensing is carried out by conductive rubber screens that are capacitively coupled to the HV terminals.